Corresponding author: Tel. : +33-472-438213; fax: +33-472-438822. A computer code was developed to simulate the operation of radiographic, radioscopic or tomographic devices. The simulation is based on ray-tracing and on the X-ray attenuation law. The use of Computer Aided Drawing (CAD) models enables simulations to be carried out with complex three-dimensional (3D) objects. The geometry of every component of the imaging chain, from the source to the detector, can also be defined. Automatic translations or rotations of the object can be performed in order to simulate radioscopic or tomographic acquisition. Simulations can be carried out with monochromatic or polychromatic beam spectra. The calculation is completely deterministic and consequently the computed images present no photon noise. Nevertheless, if necessary, noise can be added to the images afterwards, with an adjustable level. This paper provides several examples of simulated images that illustrate some of the rich possibilities offered by our software. Depending on the simulation type, the computation time order of magnitude can vary from 0.1 second (simple radiographic projection) up to several hours (3D tomography) on a PC, with a 600 MHz microprocessor. Our simulation tool proves to be useful in developing new specific applications, in choosing the most suitable components when designing a new testing chain, and in saving time by reducing the number of experimental tests. KEY WORDS: Simulation, X-ray imaging, Ray-tracing techniques, Non-destructive testing (NDT), Quality control, Tomography, Computer-aided drawing (CAD). X-ray imaging techniques, such as radiography, radioscopy and tomography, are used in more and more diversified applications, notably in the medical field , materials science  and the food-processing industry . For each specific application, it is generally a complex task to design the appropriate testing chain. Suitable X-ray emitter and detector have to be chosen, and the optimal parameter values (current and voltage of the X-ray tube, geometric adjustment, exposure time) have to be determined. To develop a new X-ray imaging system, or to optimize an existing one, long and expensive series of experimental tests and measurements are usually necessary. Sometimes the only method is to proceed by trial and error, and in practice, it is impossible to study exhaustively the influence of the many parameters that condition the final image quality. As a consequence, when the Non-Destructive Testing (NDT) application is very delicate, the development stage may seem quite off-putting, or within the reach of specialists only. Simulation offers powerful means for choosing the most suitable components and for predicting the future device performance, by acting as a virtual experimental bench. Simulated images, that can be obtained in little time and at low cost, may enable the behavior of the whole imaging system to be investigated in complex situations . In that context, a four year research program was initiated 18 months ago in the laboratory "Contrôle Non Destructif par Rayonnements Ionisants", to model and simulate the functioning of any X or g -ray imaging chain, from the photon emission phenomena, up to the detector behavior, including the photon-matter interactions within any 3D object. During this first period, we started with photon attenuation in the object, and we laid emphasis on 3D geometric aspects. This paper presents the basic principles we used and the possibilities offered by the computer code we developed. The algorithm is described in a schematic way and a few examples of simulated images are given. Ray-tracing together with the X-ray attenuation law are the basis of our computer code. From each source point, a set of rays is emitted towards every pixel center of the detector. Each ray may intersect a certain number of meshes on the sample surface or at the interfaces between different parts of the object (Fig. 1). Fig 1: (a) Principle of the simulation. A set of rays is emitted towards every pixel of the detector. The object is described with triangular meshes. For each ray, geometrical calculations enable the attenuation path length to be determined. (b) Simulated radiograph. In this formula, NÇ(E) refers to the number of photons with energy E, emitted by the source per solid angle unit; D W is the solid angle that corresponds to the pixel, observed from the source point; mi(E) designates the linear attenuation coefficient associated with the material i at the energy E, and xi the total path length through the material i.
where the index j refers to each element of the compound and wi stands for the fraction by weight associated to the element j. The image computed using Eq. (1) takes into account neither the contribution of the photons that are scattered within the object nor the scattering inside the detector, which is known to degrade spatial resolution. We did not take into account fluorescence and annihilation photons either. The Compton and Rayleigh scattering contributions to the image and the photon interactions with a real detector will be investigated in a future study. So far, we have simulated images with a "perfect" detector, in which every pixel is able to count all the photons that hit its surface. and orientation. To simulate geometric unsharpness, the source area is divided into elementary source points. Beam parameters enable, if need be, collimators to be taken into account. Fig 2: Synoptic diagram of a simulated imaging chain. Every box in this figure corresponds to a section of the simulation software, in which several parameters are adjustable. To be able to carry out image simulation with a large variety of samples (mechanical parts, food industry products, biological samples...), our computer code was designed to accept standard CAD files to describe the sample geometry. The object may consist of different parts, possibly made of different materials, assumed to be homogeneous. 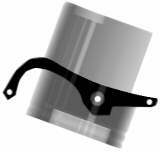 The CAD model of each part can be handled independently. Finally, the detector has to be defined (position, orientation, pixel number and size). To simulate the functioning of radioscopic or tomographic systems, it is necessary to carry out multiple simulation with automatic movements of the sample. These movements play the same role as stepper motors in experimental setups and they can be a combination of translations and rotations. Fig 3: Simplified diagram of the simulation algorithm. The simulation process consists of five loops that correspond to the incrementation of object positions, source points, pixels, energies of the spectrum and distances covered in the object. Besides the definition of geometric parameters, we have to choose a beam spectrum and the object material(s), which calls respectively for spectra and materials databases. The photon spectrum is divided into a set of discrete energy values. Each energy value is associated with a photon number, which is a fraction of the total photon number of the whole spectrum. So far, we have used the Birch and Marshall catalogue , in which semi-empirical spectral data, in the tube voltage range 30 to 140 kV, are tabulated. For each energy value, the photon attenuation calculations are repeated. The corresponding attenuation coefficients, associated with any elementary or compound substance, can be obtained by means of available databases, such as XGAM  or EPDL97 . When performing a simulation, the detector is split into energy intervals (or channels) with an adjustable width, and a set of images associated with each one is stored. To summarize the points developed in the previous section and to give an overall view of our simulation code, we have represented its broad outline by means of a simplified diagram (Fig. 3). Before the beginning of the simulation, the whole virtual imaging chain has to be defined. Two databases are integrated in the software: the first one contains cross sections and the second spectral data. distances covered in the object. For each energy of the spectrum, a partial image, containing the number of photons associated with each pixel, is stored in a matrix. A global image is computed by calculating the total energy of the photons that reach each pixel of the detector. By taking into account the iteration number in each loop, it is possible to predict how computation time evolves if more object movements, source points or pixels are necessary. Memory space has also to be considered as a practical limit. Depending on the simulation type (simple radiographic projection, 2D tomographic slice, 3D tomography with a matrix detector), the computation time order of magnitude can vary from 0.1 second up to several hours on a PC, with a 600 MHz microprocessor. The use of CAD software packages enables complex 3D objects to be drawn and CAD files to be generated in a short time, for example with the STL (Stereolithographic) or UCD (Unstructured Cell Data) format (Fig. 4.a). These files contain a list of nodes and meshes (triangular facets) that fit the object surface. The precision of this fit, which is linked to the size of the meshes, can be adjusted. In the medical field, or in the food-processing industry, the CAD models of biological samples, for example, cannot be obtained directly with the previous method. In this case, a STL or UCD file can be derived from 3D tomography or magnetic resonance imaging (MRI) data, by extracting an isosurface (Fig. 4.b). 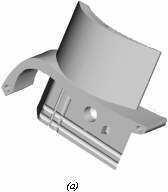 It can be noted that various flaws can be introduced in the CAD description of the part, to study their detectability. Fig 4: (a) STL description of a turbine paddle obtained with a standard CAD software package. (b) STL model of a vertebra sample derived from tomographic data. Fig 5: Radioscopy simulation performed with a polychromatic beam (100 kV tube voltage), and a matrix detector consisting of 300 ´ 300 pixels. control of factory products), can also be simulated easily by repeating elementary simulations, for each position of the object. First generation, fan-beam or cone-beam tomographic devices can be simulated as well, by computing all the projections that compose the sinogram. For example, we simulated 2D and 3D tomographic experiments on a turbine paddle and on a vertebra sample (Fig. 6). Simulation enables the influence of various experimental parameters (setup geometry, beam spectral distribution...) on the final image quality to be assessed in a short time . Fig 6: Simulated 3D tomography. (a) Slice extracted from the reconstructed volume of the turbine paddle. The simulation was performed with a monochromatic beam and a matrix detector. (b) Slice of the same object, obtained with a polychromatic beam. Artifacts due to beam hardening are visible (cupping effect). (c) Reconstructed slice of the vertebra sample, obtained with a monochromatic beam. Fig 7: Influence of Gaussian photon noise on a tomography. Gaussian fluctuations have been added to the sinogram before reconstruction. 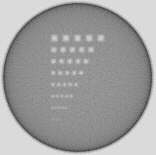 The object is a spatial resolution phantom (aluminum cylinder with square holes). An interesting characteristic of our simulation code is its deterministic principle. The synthetic images do not contain any photon noise. By adding Gaussian random fluctuations to the image (with an adjustable variance), the influence of different noise levels can be evaluated without having to repeat the simulation process (Fig. 7). Simulation can also be a precious tool to study the detectability of specified defects, depending on their size and position in the object. Simulated contrast-to-noise ratio maps , which are impossible to obtain experimentally, offer a means of determining the best experimental parameters to optimize the detection of defects. This preliminary work phase enabled us to develop the framework of a computer code, able to produce within a short time, realistic images of radiographic, radioscopic or tomographic devices. The strong points of this tool are the use of CAD models to describe complex 3D objects, the ability to adjust the parameters of every component of the imaging chain. Initially, the computed images present no photon noise, but Gaussian random fluctuations can be added afterwards, if needed. Several issues need further development and will be addressed in the next phase of our research program. As a priority, we are considering enriching our simulation tool, by taking into account the scattering contribution. The 3D mapping of the absorbed dose in the sample will be broached simultaneously. Modelling and simulating the influence of the detector response on the image quality will also be an essential task. Finally, quantitative experimental validations will be necessary. Possible application areas are numerous. Simulation can be useful, when developing any specific NDT setup, in choosing the best components, optimizing the experimental parameters and saving time by reducing the number of experimental tests. Simulation also presents an important potential for testing the performance of image processing procedures in a virtual environment, where all parameters are fully controlled. It can also be used to interpret complex experimental data, by comparing them to the corresponding simulation results . In the foreseeable future, when simulation tools are widely used, NDT aspects will be taken into account more easily at the design stage. By simulating the inspection of a product, even before it is manufactured, it should be possible to avoid otherwise unexpected and tricky NDT problems afterwards. 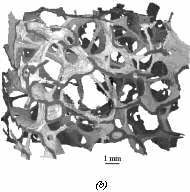 FELDKAMP, L. A., GOLDSTEIN, S. A., PARFITT, A. M., JESION, G., KLEEREKOPER, M., "The direct examination of three dimensional bone architecture in vitro by computed tomography", Journal of Bone and Mineral Research, Vol. 1, No. 4, p. 3-11, 1989. PEIX, G., BUFFIERE, J.Y., CARDINAL, S., CLOETENS, P., SALOME, M., PEYRIN, F., BABOT, D., "Caractérisation de l'endommagement dans les matériaux de structure par tomographie haute résolution à rayons X", Revue des composites et des matériaux avancés, Vol. 7, No. hors série, p. 59-67, 1997. KAFTANDJIAN, V., PEIX, G., BOLLON, H., LION, P., "Contrôle par rayons X de la conservation de produits liquides conditionnés en boîtes métalliques", International Conference on Quality Control by Artificial Vision, QCAV'95, p. 202-208, 1995. INANC, F., GRAY, J. N., JENSEN, T., XU, J., "Human body radiography simulations: development of a virtual radiography environment", Part of the SPIE Conference on Physics of Medical Imaging, Vol. 3336, p. 830-837, 1998. BIRCH, R., MARSHALL, M., ARDRAN, G. M., Catalogue of Spectral Data For Diagnostic X-rays, The Hospital Physicists' Association, 1979. BERGER, M. J., "NIST Standard Reference Database 8, X-ray and Gamma-ray Attenuation Coefficients and Cross Sections, XGAM", distributed by Office of Standard Reference Data, National Institute of Standards and Technology, Gaithersburg, Maryland 20899, Ó 1988. CULLEN, D. E., HUBBELL, J. H., KISSEL, L., "EPDL97: The Evaluated Data Library, '97 Version", UCRL-ID-50400, Vol. 6, Rev. 5, 1997. DUVAUCHELLE, P., FREUD, N., KAFTANDJIAN, V., PEIX, G., BABOT, D., "Simulation tool for X-ray imaging techniques", X-ray Tomography in Material Science, Edited by Baruchel J., Buffière, J.-Y., Maire, E., Merle, P., Peix, G., p. 127-137, Hermes, Paris, 2000. DUVAUCHELLE, P., FREUD, N., KAFTANDJIAN, V., BABOT, D., "A computer code to simulate X-ray imaging techniques", Nuclear Instruments and Methods in Physics Research B, 2000, to be published. KOENIG, A., GLIERE, A., SAUZE, R., RIZO, P., "Radiograph Simulation to Enhance Defect Detection and Characterization", Proceedings of the 7th European Conference on Non-Destructive Testing, Vol. 1,p. 444-451, 1998.